The procedure cache is where SQL Server will cache execution plans after they have been compiled. The benefit of this caching is that there is no need for the execution plans to be compiled at run time. This compiling operation typically consumes resource and slows down the execution time of the query. The obvious disadvantage of clearing out the plan cache is that all execution plans for your SQL Server instance are recompiled upon execution which may slow things down temporarily until the cache is re-populated. Great for development, give thought before executing in production. You may be under pressure to quickly get performance back to normal but it’s better to laser target the offending queries if you have time and address accordingly. You can clear out the procedure cache for specific queries as we will see further down the post. This is optional – WITH NO_INFOMSGS and will simply suppress the informational message above. Upon executing, messages with be written to the SQL Server error log for each cache store in the plan cache. SQL Server has encountered 1 occurrence(s) of cachestore flush for the ‘Object Plans’ cachestore (part of plan cache) due to ‘DBCC FREEPROCCACHE’ or ‘DBCC FREESYSTEMCACHE’ operations. So here I will clear a plan from the cache, firstly by running this query to get the plan inserted to the plan cache. Now I will attempt to find the plan_handle for the execution plan. So I can see that I want to clear out the cache for the second row as displayed in the screenshot. In this post, I look at the OLEDB wait type. “OLEDB” stands for Object Linking Embedding Database. OLEDB is an API used by SQL Server when retrieving data from a remote server or datasource. Linked server queries, remote procedure calls, BULK INSERT operations, full text search and queries to external data sources, for example Excel all contribute to OLEDB wait type. The wait type occurs when the remote system or network connection is not fast enough and so the calling server has to wait for the results to be returned. Look at your data distribution – are the linked server calls absolutely necessary? If the data being referenced is static then consider copying the data to local database and query it there. Consider using replication to bring the data local. If the data source is some file such as Excel, can you reference it locally instead of over a network connection? Is it feasible to import the Excel file into the database? Tune the remote query if you can. If it is a server which you are able to administer or you can speak with the DBA of that system, then find ways to make that query run faster – check indexes, check statistics etc. Have your network admins check over the connection between the server and data source. Is it fast enough? OLEDB may be a symptom of another wait type. For example check RESOURCE_SEMAPHORE wait type – is this high? In my last post, I wrote about how SQL Server schedules tasks to be executed. It’s important to be able to understand this when when trying to analyse wait types and statistics in SQL Server. For this post, I will be looking at the CXPACKET wait type and what you can do to reduce it. This is one wait type that can be misjudged. Occurs when trying to synchronize the query processor exchange iterator. You may consider lowering the degree of parallelism if contention on this wait type becomes a problem. This is a parallel processing wait type where many threads are used to satisfy the query. Each thread deals with a subset of the data. The idea is that if there are more threads working on different parts of the data set, it can be more efficient. Parallel execution can therefore be a highly effective way of dealing with large sets of data, for example in a data warehouse/reporting server. However, in OLTP systems, it could well have a negative impact on performance. CXPACKET wait type occurs when there are threads taking longer to execute than the other threads in that query. The completed threads are left in waiting state until the last thread can complete. I’ll go into more detail about these settings in the next section but by default your SQL Server is configured for parallelism as the “max degree for parallelism setting” is set at zero. For a query then to qualify for parallel execution, its estimated (or cached) cost needs to exceed the “cost threshold for parallelism” setting. So in an example scenario on a server with 8 cores, if a parallel query executes with “max degree of parallelism” set at zero, then up to 8 cores can be used in the query. As each core completes its work, it waits until all cores have completed. The result is CXPACKET waiting and the potential to delay other SPIDs wanting a piece of CPU time to process their request. You have to remember that CXPACKET waits are normal for multiprocessor servers because of parallel execution. So simply adjusting your server configuration in an effort to reduce this wait type could have an overall negative impact on performance. Understanding whether the system is an OLTP, DSS or combination of both is critical. It’s no good simply assuming that because you have CXPACKET waits, that it is automatically a problem. If CXPACKET is one of the top reported wait types on your SQL Server, the next thing to consider is, what are the causes and is this wait type normal for my workload? There may be other contributing factors. Is CXPACKET a symptom of something else? For example, it could be as simple as a missing index or out of date statistics. Your SQL Server then tries to compensate by generating a query plan that uses parallelism in an effort to optimize the query, or rather, to make the scan operation go faster. There are some settings which can affect how your queries use parallelism. Note that you can also change max degree of parallelism and cost threshold for parallelism settings using Management Studio. These settings can be found under the Properties->Server Properties->Advanced section. 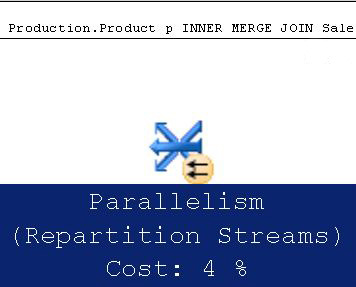 OLTP – parallelism can have a negative impact on performance. Look at your plan cache, which of your queries use parallelism? Check query plans – do you have missing indexes or out of date statistics? What other waits are occurring that might be causing CXPACKET? Consider using MAXDOP to fine tune specific queries. Set max degree of parallelism and cost threshold for parallelism to best suit your server’s function. Do not adjust max degree of parallelism without proper analysis of your servers workload/queries. In my previous post, I touched upon SQL Server wait types and in order to understand wait types in SQL Server, it’s important to know first how the server schedules tasks. On each CPU core, only a single thread or “worker” can be running at any given time. Each CPU, be it logical or physical inside your SQL Server is assigned a scheduler and it is responsible for managing the work which is carried out by threads. So depending on how many CPUs you have in your SQL Server, you will see from this DMV that there can be quite a few schedulers available. VISIBLE OFFLINE – user schedulers which are mapping to CPUs which are offline in the affinity mask. HIDDEN OFFLINE – schedulers assigned to internal operations mapped to CPUs which are offline in the affinity mask. RUNNING – the thread is actively running on the CPU. SUSPENDED – thread is waiting for a resource to become available. Thread is on the “waiter list”. RUNNABLE – resources are now available to the thread but as only one thread can execute on a CPU at any given time, the thread has to wait its turn. It goes to the bottom of the “RUNNABLE queue” and finally returns to a RUNNING state when it is its turn to run as controlled by the CPU scheduler. The size of the “RUNNABLE queue” for each scheduler can be seen by looking at the value for the “runnable_tasks_count” column from the sys.dm_os_schedulers DMV. Threads can transition around the different states until their work is completed. When on the waiter list, a thread can wait for some time before it changes state. There is no set order in which they are then changed from SUSPENDED to RUNNABLE. Each CPU (logical or physical) is assigned a scheduler. Only one thread can be running on a CPU at any given moment. Threads are either running on the CPU (RUNNING), on the waiter list (SUSPENDED) or in the runnable queue (RUNNABLE). Use sys.dm_os_schedulers to view schedulers on your SQL Server. Use sys.dm_os_waiting_tasks to view the tasks which are in the wait queue, waiting for resource to become available.